Shorter days and the end of daylight saving time are associated with SAD (seasonal affective disorder), a form of clinical depression that is believed to affect about 5 percent of the U.S. population; i may set in as people have less daylight to enjoy after they got off work. To combat the depression, the Mayo Clinic recommends outdoor activity, especially within two hours of awakening; exercising regularly; opening blinds and window shades to let light inside; light therapy; medications; and psychotherapy. As the sun sets earlier after the end of daylight saving time, many people start to develop the telltale signs of seasonal affective disorder, including irritability, excessive sleeping and loss of interest, said Jeff Janata, a professor of psychiatry and the director of psychology at University Hospitals Cleveland Medical Center. “The weeks immediately after the switch to daylight saving time is often the period of time when this emerges,” he told ABC News. While many people may exhibit some depressive symptoms in the winter months, he estimated approximately 3 percent of the population is affected by the disorder. “It’s not so much melancholy depression as it is what we think as neurovegetative depression,” Janata said. This means symptoms can run from a constant need for sleep to feeling low energy to having a constant craving for carbs. If this sounds like people with the disorder are basically trying to hibernate, Janata said, that is not far off the mark. It actually follows animal models, where there is an effort to conserve energy in the winter,” Janata said. To be diagnosed with seasonal affective disorder, a person has to develop acute symptoms for at least two years, according to the National Institutes of Health. Thankfully, for those who crave sunlight, a light therapy box recommended by their doctor can help. The light from those boxes mimics the broad spectrum of sunlight. In addition, a simple 15 to 20 minute daily walk can help with seasonal affective disorder symptoms, he said. 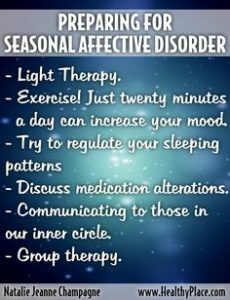 If you think your winter blues might be signs of seasonal affective disorder, Janata recommends first going to a physician for a diagnosis. “The first step that anytime you develop any inexplicable depressive symptoms is be sure to go see a primary care doctor,” he said. As with other types of depression, antidepressant medicines and talk therapy can be effective. •Take medicines the right way. Ask your provider how to manage side effects. •Learn to watch for early signs that your depression is getting worse. Have a plan if it does get worse. •Try to exercise more often. Do activities that make you happy. DO NOT use alcohol or illegal drugs. These can make depression worse. They can also cause you to think about suicide. When you are struggling with depression, talk about how you are feeling with someone you trust. Try to be around people who are caring and positive. Volunteer or get involved in group activities. Tune in to LRJFoundation’s Website all week to receive more educational information about Seasonal Affective Disorder.